I heard many jade eggs are fake. Do you have any pictures of fake jade eggs for my reference? I purchased one set of jade eggs that was marketed as "water jade" and "xiuyan jade" from another merchant.The eggs changed color after a few weeks. Why the eggs change color? Is it safe to use these eggs? Do you provide user instructions for jade egg practice? Is your mine certified nephrite jade mine? 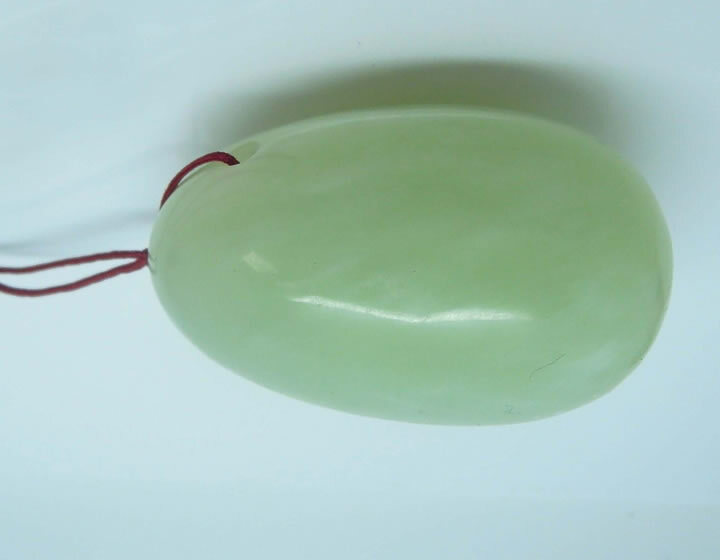 Is your genuine nephrite jade egg 100% natural color, no treatment and blenching? Where to buy your genuine nephrite jade eggs? I am not a reseller but an individual who only wants to buy 1 or 2 eggs. Why my genuine nephrite jade egg has blemishes? I'd like to purchase a medium yoni jade egg. I don't see an option to purchase through your site. Not sure if I am missing something? I need help in knowing what size to buy, can you help me? Q: I heard many jade eggs are fake. Do you have any pictures of fake jade eggs for my reference? A: Well, if you Google "jade eggs", you will find many"jade eggs". 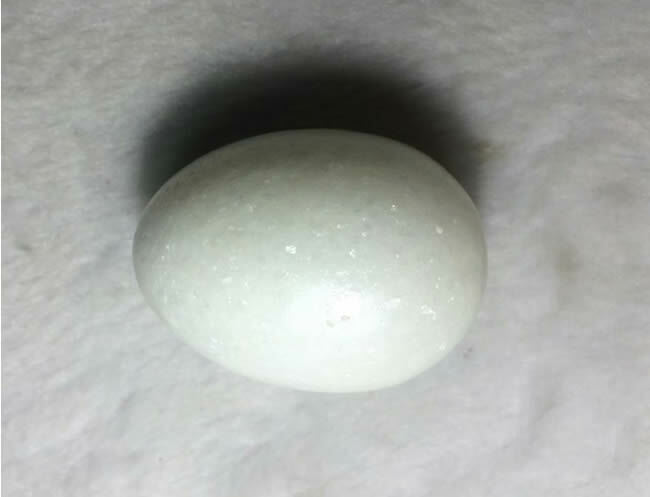 If the description is "jade egg" only, without mentioning the stone type, no hardness and specific density data nor reflective index data, most likly the "jade eggs" are FAKE. Hardness, specific density, reflective index of real nephrite jade are 6.0 - 7.0, 2.7 - 3.0, and 1.65- 1.67 respectively. Pictures of some fake "jade eggs" are provided below for your reference. If any jade egg looks like one of those in the pictures below, highly possible it is FAKE. Hope your jade eggs are NOT one of these types. Q: I purchased one set of jade eggs that was marketed as "water jade" and "xiuyan jade" from another merchant.The eggs changed color after a few weeks. Why the eggs change color? Is it safe to use these eggs? A: The eggs you purchased are not real jade, but fake that are actually made of serpentine, a translucent soft and loose marble stone. Serpentine is often used as jade simulant in China and is often marketed as "water jade", "new jade", "xiuyan jade", "xiuyu jade", "serpentine jade", "nephrite serpentine jade", or just "jade eggs" without mentioning the actual stone name. While there is no scientific data yet to prove the serpentine is hazardous, we strongly sugggest you do NOT use your ligtt green serpentine eggs. Considering the intimate usage, any stone that de-colors over time is NOT suitable for yoni eggs. Q: Do you provide user instructions for jade egg practice? A: We are a manufacturer. We focus on our strength in jade egg making while leaving jade egg practice coaching to other experts. You can easiy find jade egg trainers and coaches if you Google "jade egg practice". If what you need is just some simple information about how to use jade eggs, we have a short user instructions for you. Please click the link below to download the pdf file. Q: What is "helu jade"? Is "helu jade" a real jade? A: Recently a few people ask us about "helu jade". They ask: what is "helu jade"? Is "helu jade" a real jade? Q: Is your mine certified nephrite jade mine? A: We received quite a lot very similar questions like this. At beginning, we are quite puzzled by this question, and do not understand why this question is asked and how a mine can be "certified". We did some research, then found why this question is asked: there are some people claim their "jade eggs" are from a "“certified nephrite mine". 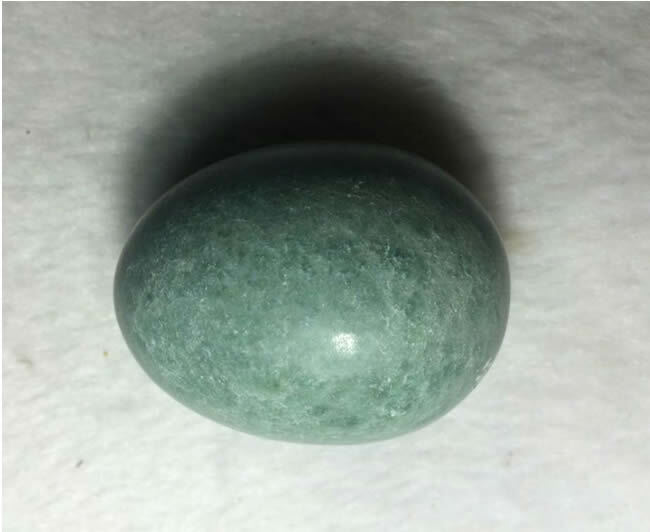 Q: Is your genuine nephrite jade egg 100% natural color, no treatment and blenching? A: Yes, the color, shade, tone,and texture etc. of our genuine nephrite jade eggs are all natural. The eggs are manually carved and polished from genuine nephrite jade without using any chemical treatment and dyeing. Nephrite jade eggs have variations in color, shade, tone, pattern and texture. Even from the same batch, the jade eggs may be cut from same boulders or from different boulders, or from boulders mined from different nephrite veins. Every genuine nephrite egg is different from each other. That is the beautify of nephrite, a gift from the GOD to us. We guarantee all eggs are genuine nephrite jade eggs without any chemical treatment or dyeing, but we cannot guarantee the eggs you purchase look the same as the ones showed in the pictures. Q: Is serpentine (called Xiuyan jade in China) true jade? A: Serpentine is called Xiuyan jade, or Xiuyu jade, or new jade in China, and is often used as nephrite replacement. Is serpentine (or Xiuyan jade or Xiuyu jade, or new jade) a true jade? There are only 2 TRUE jades: nephrite and jadeite. Serpentine is very soft. You can easily scratch the surface of serpentine with a metal nail. Serpentine changes color over time which is called "zuoshui" in China, indicating the change of mineral composition over time. Nephrite jade consists of calcium- and magnesium-rich amphibole mineral actinolite with mineral formula of : Ca2(FeMg)5(OH)2(Si4O11)2. Nephrite jade is a very hard and very strong stone, with Mohs hardness of 6.0 - 7.0. Nephrite jade is harder than steel. You CANNOT scratch the surface of nephrite with a metal nail. Color of nephrite jade can be white, green, gray, brown, yellow, black etc. Because of the color similarity, serpentine is often used in China to make fake nephrite jade products.9 out of 10 "jade eggs" on the market are fake jade eggs made of serpentine or other marble stones. Q: How to clean & care for nephrite jade eggs? A: Please sanitize nephrite jade eggs before your first use. You can sanitize it by washing with soap then rinsing thoroughly with clean water, or boiling, brushing it. Q: Where to buy your genuine nephrite jade eggs? I am not a reseller but an individual who only wants to buy 1 or 2 eggs. Or please search for "nephrite jade egg" or "Genuine Jade LLC" at Amazon.com or Etsy.com. Q: I heard that many jade eggs on the market are fake, how can I know if a jade egg is fake jade? A: Many merchants and suppliers have a tendency to call any green or white-looking stone or any translucent stone "jade", when it may really just be onyx, serpentine, 2 variants of marble stones. Specific density, mohs hardness, and refractive index of genuine nephrite stone are 2.8 - 3.1, 6.0-7.0, and 1.606 - 1.632 respectively. Genuine nephrite jade is harder and heavier than most fake jade stones, and harder and heavier than even steel. Q: Why my genuine nephrite jade egg has blemishes? A: Our genuine nephrite jade eggs are manually carved and polished from 100% natural and genuine nephrite jade without using any chemical treatment of dyeing. The blemishes are natural inclusions of the nephrite jade, which form signature and unique tone of the jade eggs. Because of the nature of the nephrite jade and manual carving and polishing process, genuine nephrite jade eggs have variations in color, shade, tone, pattern and texture. Some eggs may be cut from one large boulder of nephrite jade rough stone, while other eggs are cut from another boulder. Jade eggs cut from different boulders, even from the same nephrite mine and from the same nephrite vein, are different in color, shade, tone, pattern and texture. Even cut from the same boulder of nephrite rough stone, jade eggs are different from each other. The colour, shade, tone and texture of each piece is unique and is the ONLY one in the world. Therefore, please do not feel surprised when you see the nephrite jade eggs delivered to you have variations in color, shade, tone, pattern and texture, or have blemishes. Even from the same batch, the jade eggs may be cut from same boulders or from different boulders, or from boulders mined from different nephrite veins. Every genuine nephrite egg is different from each other. That is the beautify and uniqueness of nephrite jade eggss. Q: I'd like to purchase a medium yoni jade egg. I don't see an option to purchase through your site. Not sure if I am missing something? A: If you are a reseller who want to buy more than 3 eggs for resell, please contact us using the contact information in this web site. We would be more than happy to help you. Q: I need help in knowing what size to buy, can you help me? A: While we are not expert in jade egg practice because we focus on our strength as a jade egg manufacturer, I would like to share some information we have with you to help you make decision. 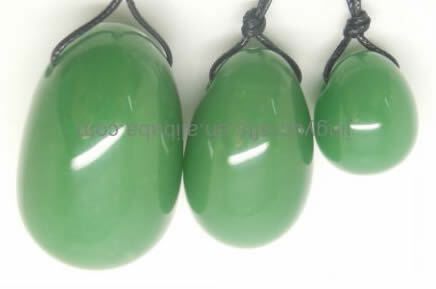 Some jade egg coaches recommend beginner users to start with large size first because large size is easier to feel and to hold, then use medium size, then small size. So, you may want to consider either having the medium size first, or getting one of the value sets for better value.